Brandon Melendez performs at the Cantab Lounge during his 2017 run for the Boston Poetry Slam Team. Photo by Marshall Goff. Brandon Melendez is a Mexican-American poet from California. WEST COAST. 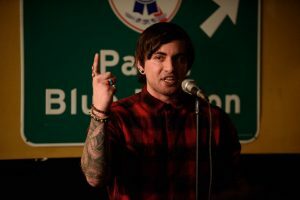 He entered the national slam scene in 2013 and within a few days he had already heard about the powerhouse venue at the Cantab Lounge. It took him moving to Boston for school to finally visit, but when he did he immediately felt at home. Brandon is the author of ‘home/land’ (Write Bloody Publishing 2019). He is a National Poetry Slam finalist and two-time Berkeley Grand Slam Champion, as well as a member of the 2017 Boston Poetry Slam Team and a 2017 National Poetry Slam Group Piece Finalist. He was awarded Best Poem and Funniest Poem at the collegiate national poetry competition (CUPSI). His poems are in or forthcoming in diode, Ninth Letter, Muzzle Magazine, the minnesota review, Sixth Finch, and elsewhere. He is currently an MFA candidate at Emerson College. Feel free to reach out for booking or friendship at brandonmelendezpoetry@gmail.com.